First, to the options. If you opt to install Linux in a dual-boot way, you can either install it externally or internally. If you go the former route, the advantage is that your Chromebook will barely change from the way it is. This option is particularly useful if you have used your Flip for a while (that is, lots of customization) and it’s already in Developer Mode (since that wipes the device, anyway). The advantage of installing internally is that the internal storage device is much faster than virtually anything you attach, and you’ll end up with a snappier Linux. Second, to the hardware. The Flip has a zippy Skylake processor, for which support is relatively good. Relatively means that the only thing known to absolutely not work (at the time of writing) is the internal sound system. If sound is important to your work and you can’t live with Bluetooth, you sadly have to pass for now (but check back later, as there is a lot of work being done right now). Third, external devices. This is a sad story, unfortunately. Apple introduced the stupid idea of having only tiny numbers of ports and Asus followed suit. The only external ports you’ll find on the new Flip are an SD card slot and a USB-C port. Yes, you can attach anything you want on the latter – but it will stick out like a sore thumb (drive). You can install on an SD card, but that comes with lots of issues, as I found out. Fourth, installation options. Basically, there are two ways of dealing with the installation: the regular Linux installer and a new software package, chrx, which is more specifically geared towards the issue at hand. I ended up with chrx because it was the only non-frustrating option. Without much further ado, here is the sequence of steps I followed to have an amazing installation of GalliumOS in dual-boot. Please, make absolutely sure you read the section below the sequence, where I describe the issues I had, because they explain in detail what and why. Activate developer mode. Skip to the next step if you are already in developer mode. Activating developer mode will factory reset your Flip, so you will lose all data on the device! The system will warn you that it will go into Developer Mode in 30 seconds. Wait 30 seconds. You will lose all data on the device! The system is going to enter Developer Mode, which takes anything from forever to an eternity. Then it will reboot. Ugly screen again. Get used to it. Hit Ctrl + D. Memorize the key combination. Or wait and hear the super-annoying double-beep of doom. The Flip starts in ChromeOS mode. All your data has been erased! Notes: The process was extremely frustrating and painful for me. Initially, I tried to install on a memory card using the GalliumOS installer from an ISO image on a USB stick attached using a USB-C to USB-A converter. GalliumOS started just fine, it ran the installation on the card just fine, but when I tried booting, I got nothing. The text mode screen said it was starting from Hard Disk and just froze there. Next I tried to install using chrx on the card, which you can do. Same result. Since GalliumOS started fine from the ISO, I knew the problem was not the OS but the configuration of the installer. trying to triage the issue, I read that the problem could be the SD card, so I got a new one. Same issue. I finally restored the factory image, which apparently doesn’t reset the boot flag (still in Developer Mode), but everything else. Still, running from SD card netted me a big fat nothing. This was the 12th time I tried, so I decided to go for the approach above: I reset to factory image (still in Developer Mode, though) and let chrx run its default mode. In it, it takes part of the internal drive on which ChromeOS resides and installs Linux there, making it unavailable to Chrome. I decided that was an OK thing to do, since I had an SD card to save things on. In the end, it was better this way, because I could use the SD card to share information between ChromeOS and GalliumOS. I should also note that chrx, annoyingly, won’t allow you to save the downloaded image and always fetches it fresh, no matter how many times an hour you try and fail to install. What do you know, this time was the charm and GalliumOS booted just fine. It’s fast, it’s full-featured, and it has the power of Ubuntu behind it (it’s a modified version of Xubuntu). Note that chrx allows you to install full Ubuntu and a bunch of other distributions and variants, but it installs GalliumOS by default. As you noticed in the litany of errors I got, this process was not easy. I hope I made it easier for you, but I must disavow all responsibility and give no warranty that any of the steps above is (a) correct or (b) free from perils, risks, and/or injury. In particular, if you didn’t backup your data and/or have no recovery image available, you shouldn’t have read this article and should probably not own computers in the first place. You may apply for a position in IT security at Equifax, possibly. over the last few months, I’ve been running Gallium on internal drive as well. I find that sometimes, the pointer will do weird things, like disappear from one edge and reappear on the other — and using the touchpad or even the touch screen doesn’t help. I don’t think an external mouse helps either. I also occasionally have some sleep/wake from sleep issues. Have you had anything similar? Or any other “quirks” you didn’t expect? I am thinking of maybe, just for giggles, installing another linux distro — maybe just k/l/ubuntu, or mint…I haven’t found many resources online for it. Know anyone who has tried it? I am a web designer trying to get away from windows, and much to my dismay, the chromebook is not great tool for this line of work. Do you know of another distros like mint, or elementary for the c302 flip that allows you to keep all the bells and whistles that come with the flipbook, like bluetooth, sound , and touchscreen? That is also good for a newbie to Linux. Hey Marco, thank you so much for this tutorial. 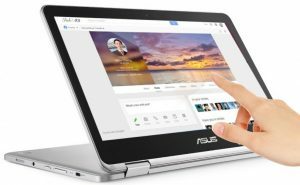 It made is extremely easy for me to install Linux onto my Asus C302. I was wondering if you know how to get other things working on GalliumOS for this laptop. One main issue I am having is that if I close the lid, it goes to sleep, and I cannot wake it up (unless I do a hard reboot). The current workaround is that I must close the lid while NOT plugged into power, and then open the lid while connected to power. Obviously this is a pain, lol. Besides this, I was hoping I could customize the OS, similar to what I’ve done in the past on Ubuntu. TIA! I have the same chrome book flip but I get stuck at the “update firmware” step. It says that it does not support an ARM device but it worked for your chrome book flip? Can I skip this step to get linux or am I not able to get it at all? The article is about a Chromebook Flip C302. The ARM device is the Flip C101PA. Sorry!!! thanks for the post! Was this for the latest model of the C302 (as of Feb 2019), i.e. the C302ca (which also seems to be called C302ca-gu010 in some places)? Is the dual-boot option the only option? It does seem that – while the ‘Android subsystem’ is supprted, the official ‘linux subsystem’ isn’t supported on the C302. Do you have a view as to whether this is likely to happen in the future? I guess it’s hard to tell. Then there’s chromebrew. Have you tried to use Chromebrew? I’m essentially after using one linux app (Zotero) + plus having some shell tools (perl/emacs/python), so something like Chromebrew might be a good option, but again, not sure what the systems requirements are. Hey, Bjoern! The article is two years old and hasn’t been updated, so it might or might not work for later versions of the C302. I found the installation of GalliumOS at the time very finicky, so ended with the default settings that worked. Back in the ancient days of 2017, there was already the single-boot option (GalliumOS only) option, but I couldn’t get it to work (probably an issue with the correct boot device). Things may have improved since then. I haven’t used chromebrew, yet. Secretly, I have been waiting for Crostini to land on the C302, but that’s not happened, as far as I know. If it comes to it, I’ll write another article about that! And maybe one about chromebrew, although right now the C302 has crouton in it. Thanks! This has been invaluable.